In another ankylosaur-related announcement this week, National Geographic has published an [article] discussing a new amazing fossil. In 2011, miners in Alberta, Canada were excavating some rocks from 110 million years ago (Early Cretaceous) when several ankylosaur bones tumbled out of the hillside. 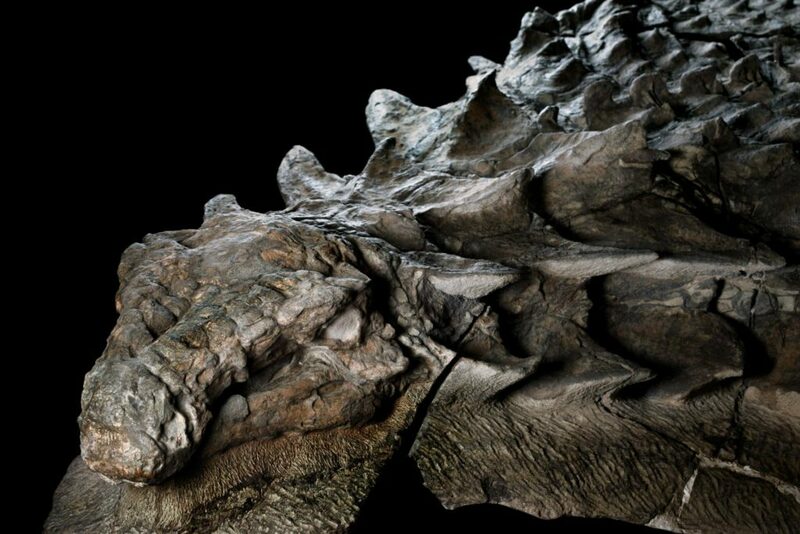 A photo of the new nodosaur specimen. Photo by R. Clark. The mining company reached out to the Royal Tyrrell Museum for help, and the specimen was collected. After six years of work, enough of the fossil has been exposed to be able to publish a paper on it. The paper is almost ready for publication, so more discussion will come soon. What we do know is that this fossil is of a nodosaur, a type of armored dinosaurs without club tails. The nodosaurs are part of the ankylosaur group, but form their own clade within it. 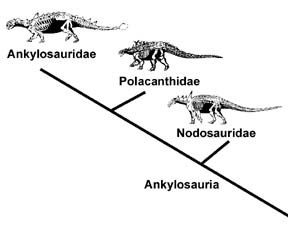 A cladogram of Ankylosauria showing Nodosauridae (the nodosaurs) and the rest of the ankylosaurs. From T. Holtz. This particular nodosaur is almost perfectly preserved in three dimensions. It was likely washed out to sea and quickly buried upside down, keeping most of its skeleton, and all of its armor, intact. It almost looks like a statue since it’s so complete! We will have to keep a look out for more information once it’s published. This entry was posted in English and tagged Ankylosauria, Canada, Mining, Nodosauridae. Bookmark the permalink.